Rather than the flowers or elaborate patterns common in the increasingly popular adult coloring books, fourth-year University of Virginia student Uzo Njoku’s coloring book features women who inspire her. There is a page for Malala Yousafazai, the Pakistani girl who, at age 15, was shot by the Taliban simply for trying to go to school. She has not stopped fighting for female education since. There is a page for Mexican artist Frida Kahlo, tennis star Serena Williams, Beyoncé, “Rosie the Riveter,” Yoko Ono, and so many others – athletes, civil rights activists, scientists, politicians, artists and more. There are even anonymous women, shown graduating from college and graduate school, during pregnancy, with children, or at work. Njoku drew each of them, set against intricately patterned backdrops and accompanied by detailed descriptions of each woman and all she accomplished. “I was looking for a coloring book with people that inspired me,” said Njoku, a studio art major whose paintings often feature African and African-American women against striking patterned backdrops inspired by west African ankara fabric. The concept, it seems, struck a nerve. 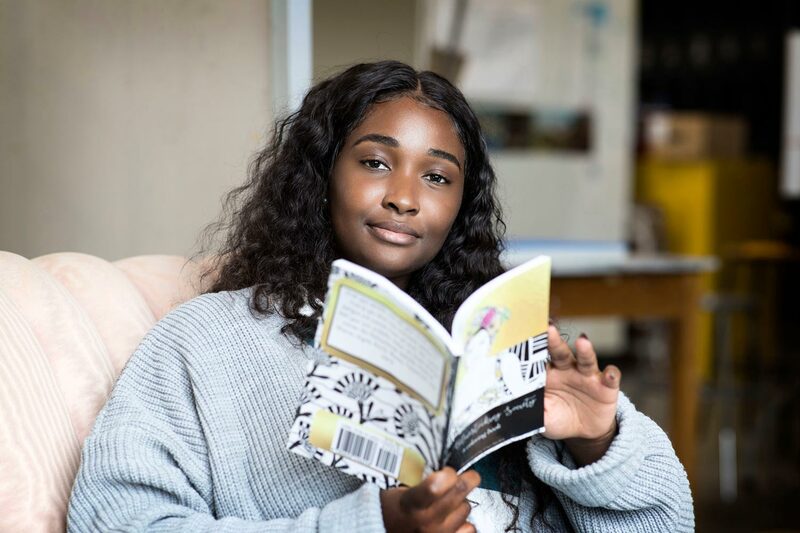 Just four months after creating the book – completing the drawings on nights and weekends after her summer job – Njoku has sold 1,400 copies. The $15 book is available in the UVA Bookstore, at several independent bookshops on the East Coast (including New Dominion Bookshop in Charlottesville) and online. There are copies spread around the world; she’s had orders from as far away as New Zealand and Lagos, Nigeria, where Njoku lived until she was 7. There are also copies all over Charlottesville. 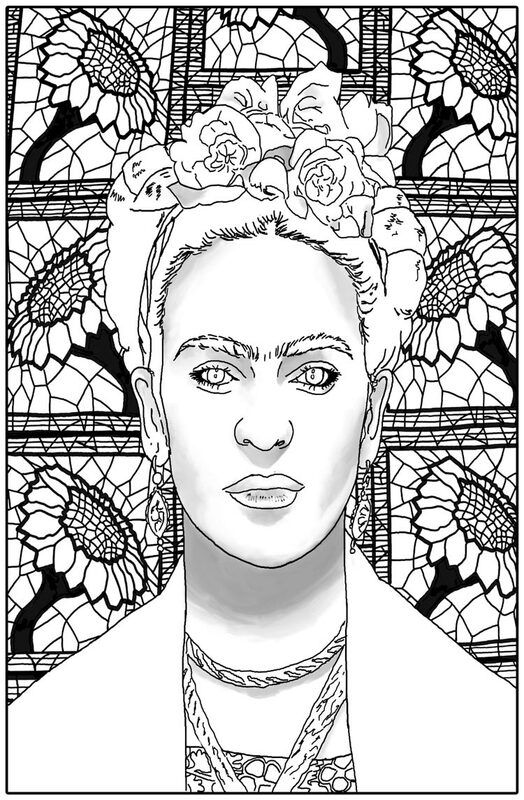 Click on the image below to access a downloadable version of Njoku's drawing of Frida Kahlo to color in yourself. If you want to share, send your finished work to socialmedia@virginia.edu for a chance to be featured on UVA's social media accounts. UVA’s Maxine Plazter Lynn Women’s Center bought 60. The center plans to give the books to girls in the Young Women Leaders Program, which pairs UVA undergraduate women with middle school girls for one-on-one mentoring. They meet each week for activities and discussion sessions, and the UVA students also take a course, Issues Facing Adolescent Girls, that prepares them to help their young mentees. Since its founding, the program has served more than 1,200 Central Virginia middle school girls. Njoku believes everyone can find someone to relate to in the book. Miller-Bryant also believes the younger girls will be inspired by Njoku herself. “Uzo is just a fabulous young person and a wonderful model for youthful female leadership,” she said. Njoku published the book herself, teaching herself about things like ISBNs – international standard book numbers assigned to each edition of a book – copyright, and creating an LLC. She found a company in New Jersey to print the book, and packs and ships the orders herself. “All the [U.S. Postal Service] people know me now because I am always there dropping off packages,” she said, laughing. It’s been a lot of work, but the student-artist is independent and entrepreneurial by nature, and she has only grown more so since deciding to switch her major from statistics to studio art. Last year, Njoku held a pop-up art show, complete with a jazz band, in a vacant storefront in Charlottesville’s Barracks Road shopping center. In December, she held her first international show in Lagos, in an empty warehouse owned by the real estate company she reached out to. She still has extended family in Lagos and returns most holidays. Njoku figured out a way to complete her paintings in the U.S., carefully remove them from the wooden frames of her canvasses, carry them with her to Lagos and set them up again. “It was great practice, because of course some things did not go as planned,” she said. Her next goal also has an international component: she hopes to finish her thesis project in December and then study abroad in London before graduating from UVA in the spring. While in the United Kingdom, she said, she plans grow her book’s audience in Europe. “I already have a market in Europe, but it can be harder to ship from the U.S.,” she said. After graduation, Njoku hopes to stay at UVA through the Aunspaugh Fifth Year Fellowship, which supports talented art graduates from the McIntire Department of Art for one year of intensive study before a graduate program. After that, she plans to seek out international shows and residences before returning to school for a graduate degree in fine arts. “I want to make sure that I am prepared, that I have traveled and development my art to my best potential before going into a graduate program,” she said. She will keep sharing her book every step of the way.